In Tanzania too there has been a raging debate over the introduction of the Kadhi’s courts in the legal and judicial system. Like in Kenya, the most vocal and visible opposition against Kadhi’s courts assumes a religious character, with the church being at the forefront of those most hostile to its introduction. 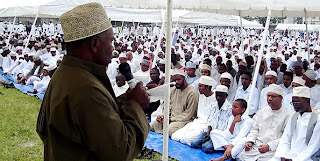 But the motion to reinstate Kadhi’s Courts in Tanzania was first introduced by an opposition leader, the Honourable Lyatonga Mrema of the Tanzania Labour Party (TLP), undoubtedly as a political strategy to win Muslim support in the 2005 General Elections. The ruling party is said to have appropriated the motion, turning it into a campaign pledge to make the same a reality in exchange for the Muslim vote. Not surprisingly, as the 2010 elections loom, the issue is gaining renewed vigour. Religious forces have kept the matter very much alive in various spaces, including pulpits, newspapers and blogs, intensifying the pressure on the government to concede on the issue. Using a variety of advocacy channels, some Islamic bodies institutions have embarked on a media advocacy strategy aimed at consolidating Muslim opinion over the introduction of the Kadhi’s court. Dismissive remarks by the Prime Minister Mizengo Pinda during the 2009 budget session on the issue of the Kadhi elicited a harsh reaction from Muslim quarters. To appease the situation, the chief mufti, Sheikh Shaaban Simba, formed a committee to advise and negotiate with the government over the matter. In response, the prime minister also formed a committee to engage with the Muslim Council. Concrete proposals to introduce Kadhi’s courts failed to come up during the recently concluded parliamentary session in November. In the meantime, the government has directed the Law Reform Commission to collect views and make recommendations on the matter. Women’s voices are noticeably absent from the discussions. From available reports, there is no female representation on this crucial body, advising on the most intimate aspect of family and social relationships. This absence of women’s interest in the ongoing discussion is not only a physical absence but also an absence of gender considerations in the overall content of the proposals in substance. Largely, the voices of women have been sidelined or muffled by political forces informing the debate. Yet, it is they who stand to loose the most from what is being proposed. Indeed, the overwhelming interest in Kadhi’s courts does not seem to be a preoccupation of Muslim women, but of sections of the Muslim community who seek political advantage both from political parties and in the larger community. Otherwise, it consumes most those sections of the community who stand to benefit the most from the existence of Kadhi’s courts.